Imagine yourself a talented creator of furniture, wood furniture made mainly of pine and cedar. 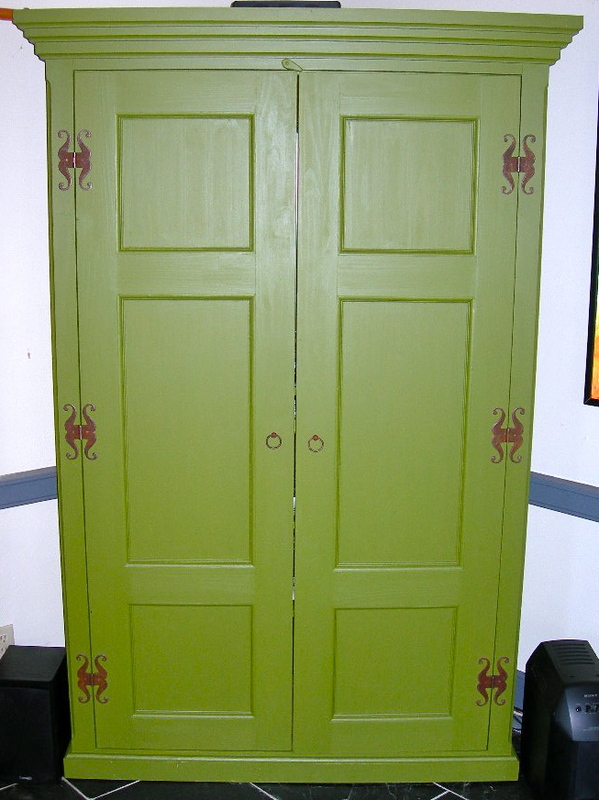 Beautiful benches, chests, cupboards and armoires furnish your home. You end up with smaller pieces of wood, left-overs from those bigger items. 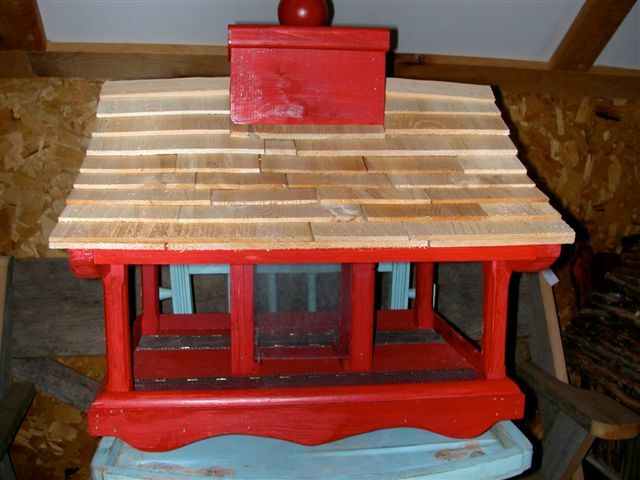 If you’re Jean Long, you use these pieces to make birdhouses and feeders. 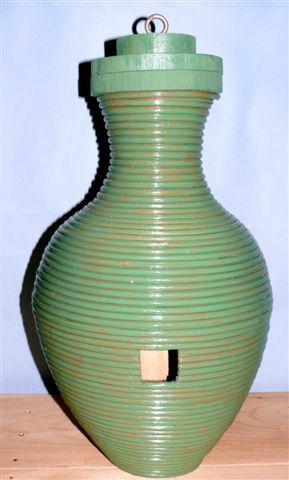 An astonishing variety of birdhouses and bird feeders – most of them whimsical, each of them well-made, each unique in some way. Although I’ve known Jean for years, and have been lucky enough to own a Jean Long birdhouse, I start to smile the moment he opens his studio door for the latest tour: I never know what to expect, but I know it will be fun – a journey of discovery! 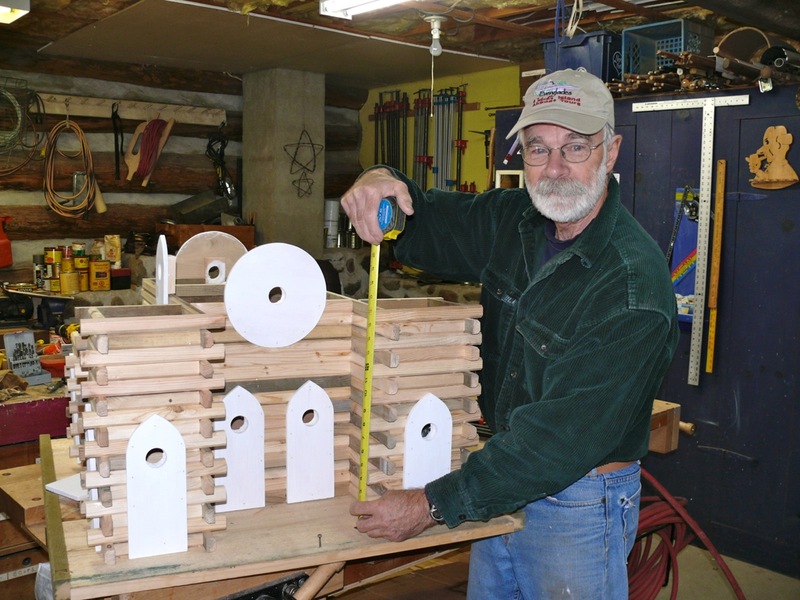 Over the years, Jean has built hundreds of birdhouses. Roughly half of them were given to friends or donated to organizations for fundraising purposes. Many are scattered over his 10-acre property. 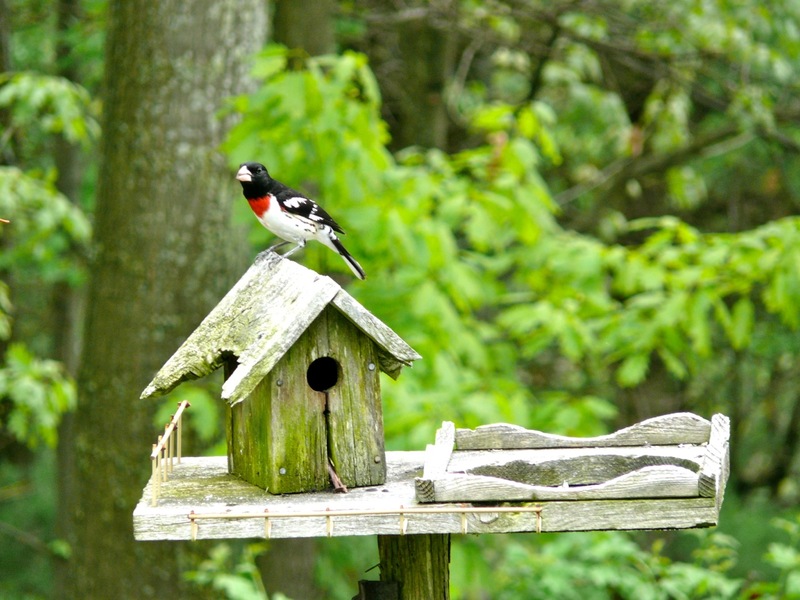 A former educator in a demanding leadership role, Jean found building birdhouses a form of stress relief. Retired now, he still has birdhouses on the brain. Since each creation is an original, the challenge (and joy) is to keep creating new designs. Some ideas come to Jean in his dreams. Some come from the sheer drive to find out how many objects he can use in his birdhouse designs. 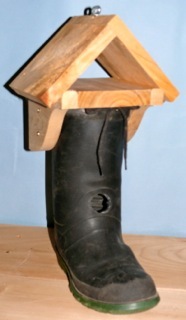 “I use old rubber boots, watering cans, old lamps parts, hub caps, old metal roofing , scrap metal, old nails, old frames, old windows, barn wood, etc…. to build my birdhouses,“ Jean says. 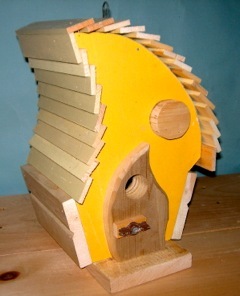 Today, Jean is working on his 867th birdhouse. 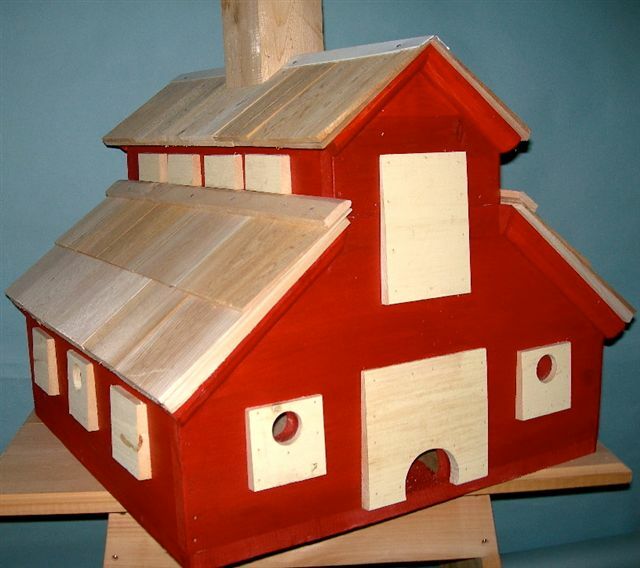 It’s a large, very complex one that takes much time and patience – he calls this kind his ‘’Xtreme Birdhouses’’. And they’re stunning, even when in progress. I can hardly wait for this one to be completed. 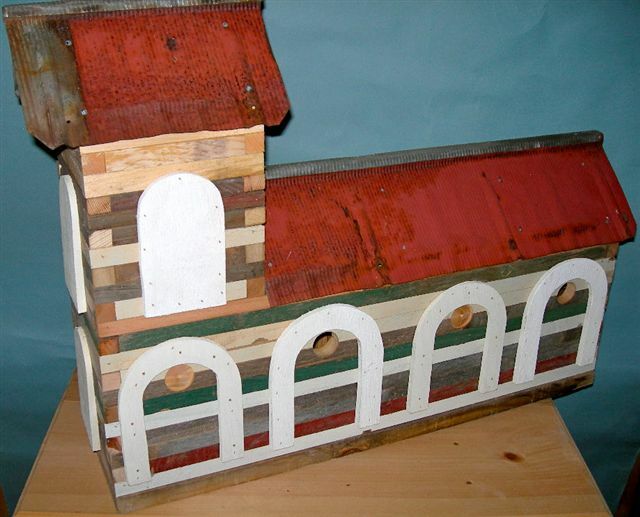 Jean got his talents from my Dad….. always thinking of something new or old to build. I’am proud of my brother. What a talent he has, Francine! Remarkably creative work. This one’s for the Birds!! Delightful. 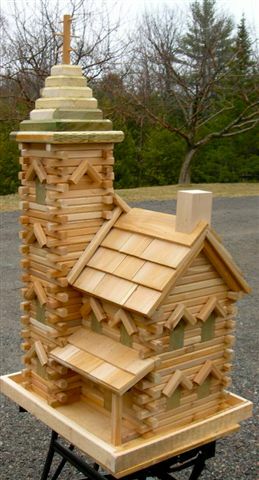 Perhaps if I had a few bird houses like that, the birds would stop trying to nest under the eaves. Maybe they just like your eaves! You’re heading into your spring or summer now? I keep forgetting. Maybe that’s the solution to my winter problems. I’ll travel the world, going from summer to spring and summer again. Fantastic work – so creative! Love the incorporation of recycled/upcycled materials. Me too, Sheryl. Nice to hear from you. Yes ma’am those are some fine looking bird houses. I really like the one that looks like the barn. And I see you are doing what you do so well and so often here. Making somebody else look good – helping somebody else to shine. Have a wonderful weekend, Cynthia! And thanks for the compliment. It’s not entirely altruistic, I must confess. I’ve rarely gone out in the last year (that’s why everyone came to my verandah) and by taking an interest in the lives and accomplishments of passionate people I know, I feel like I’m ‘adventuring’ a bit. Thank you, Julie. always glad when you drop by my blog. I must offer you a glass of lemonade next time you visit. Or some Jamaican rum punch? They are such fun. What an imagination. Indeed, Chloris. And I think he’s heading very close to his thousandth creation now. I can hardly wait to see what that one is like. I LOVE rustic birdhouses. We have a few around our property also. None as wonderful as Jeans!! 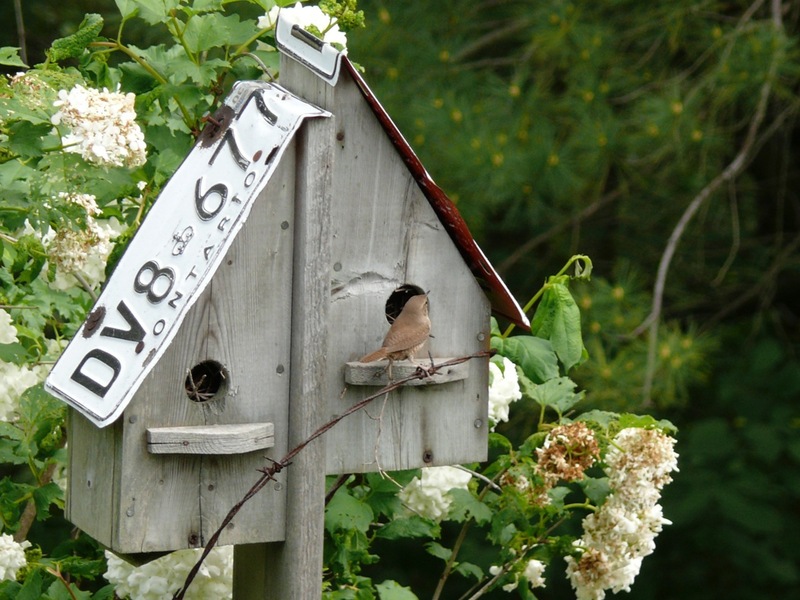 One of these days, you must do a post about your birdhouses and the visitors to them. I will as we have a few that are strictly for bluebirds and they are the most beautiful birds!! We love watching them and seeing the babies grow. A wonderful stress-busting idea. Original and useful. Artistic too – he could easily put them in an exhibition. Thank-you for re-blogging this one. I thought I was suffering from deja-vu at first and felt a bit weird but then I realised I must have read it a while ago. Hah! You and I have the opposite problem here. I would likely never remember if I saw something from several months ago! Actually, several of the photos are new. I added them to the existing post because I felt I hadn’t allowed enough photos in the original. It’s great to be surrounded by creative people! Oh, how wonderful! 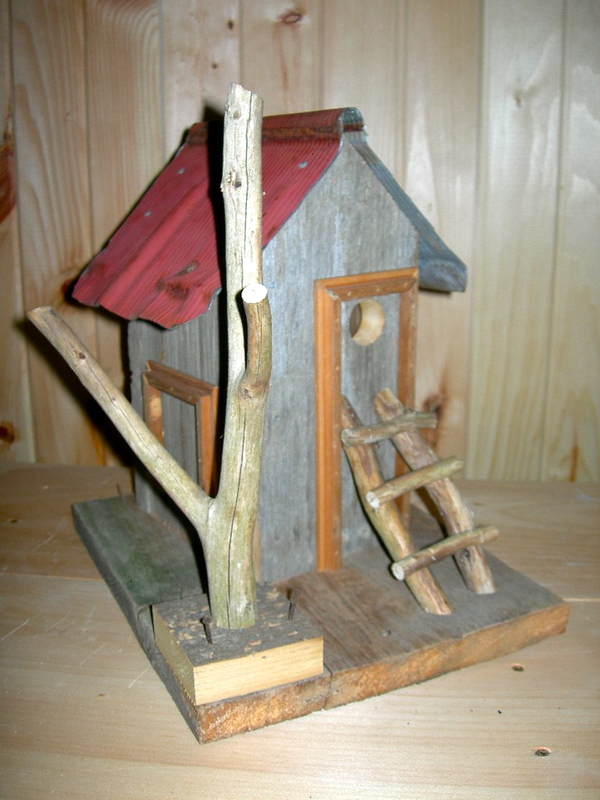 I love how he took the discarded and seemingly useless pieces of wood and turned them into such darling masterpieces for the birds. Well, you being such a resourceful and creative person yourself, that’s a big compliment to Jean. thank you and I look forward to seeing pictures of the new place on your blog! Oh, these are wonderful…he’s a clever man! Thanks for sharing. Thank you. Glad you like Jean’s creations. We have placed water in large flat containers around our garden as we have lots of swallows and other birds in and around our garden on the mountain.. It is very dry at the moment 36 degrees yesterday with 15% humidity. I think that these luxury homes and feeders are delightful and certainly would bring a great many birds into anybody’s garden. thanks Cynthia.